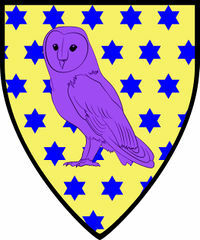 Or, mulletty of six points azure, an owl purpure. Alana found the SCA through a newspaper article while in high school and joined up with a group once she hit college. When she came home from school, she discovered Carillion. She says of her early days "Baron Pug had a real gift for gathering in the folks lurking on the edges and getting them plugged in and involved. Before I knew it I was plugged in and part of the group. Rather than sitting on the sidelines in was actively involved and participating." Life demanded a bit of a break from SCA things for a while, but eventually, Alana returned to the society and now can be found primarily in Settmour Swamp. Alana of Carillion started in garb generously donated from people, but originally was too busy doing All The Things to focus on backstory. Since her return, however, she has gravitated toward a Middle Eastern persona. Alana was recognized with the Sable Bell of Carillion for her service. She can often be found lending a hand in the kitchen and has been a youth minister, a chirurgeon, and a MOL. She also loves seeing old friends and meeting new ones. 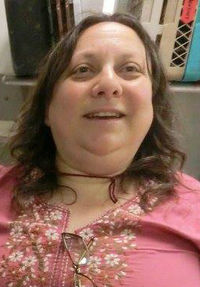 She enjoys learning new things and seeing the works of others in the community. In the event that Alana's presence is requested in court, she would prefer to have advance notice as she is not fond of surprises. She can also then inform people who should be in attendance. This page was last edited on 23 September 2018, at 23:53.